Historical fiction was what first interested me in history. Authors like Kenneth Roberts and Bruce Lancaster and, more recently, Bernard Cornwell and George MacDonald Fraser, make learning history fun. Of course it is fiction and needs to be leavened by the work of historians, but the best authors of such fictions are careful to present a credible account. One of the first I encountered, probably in the Saturday Evening Post to which my parents subscribed, was C.S. Forester. I still enjoy re-reading his books about Horatio Hornblower and war at sea during the time of the French Revolution and Napoleon. In 1927, C.S. Forester purchased three volumes of The Naval Chronicle from 1790 to 1820. For the Chronicle, officers of the Royal Navy wrote articles on strategy, seamanship, gunnery, and other professional topics of interest to their colleagues. The Chronicle for those years covered the wars with Napoleon. Reading these volumes and traveling by freighter from California to Central America allowed the germination of the character Horatio Hornblower as a member of the Royal Navy in the late eighteenth century. By the time Forester's journey brought him home to England, the former medical student-turned-writer had plotted Beat to Quarters, and it was published in 1937. A Ship of the Line and Flying Colours were published soon after, and in 1939 all three appeared as Captain Horatio Hornblower. 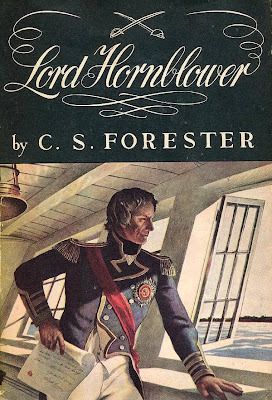 Forester's interest in the Romantic period and the political and military maneuvers of the early 1800s continued, and the Hornblower saga was produced. Subsequent volumes in the series were sequels to the original trilogy or filled in its gaps. The episodic quality of the novels is due partly to their having appeared serially in magazines, primarily the Saturday Evening Post. Most of the books were written around the time of World War II, which influenced Forester to concentrate on strong military leaders and heroic deeds in the earlier world war he described. Hornblower's complexity has endeared him to readers. He is cynical but compassionate, courageous but not without fear. Self-conscious and socially unconfident, his marriage is a mismatch, and he finds himself in love with the Duke of Wellington's sister. Above all he is a consummate seaman, deserving of the loyalty of his men. adapted from C.S. Forester, The Hornblower Companion: An Atlas and Personal Commentary on the Writing of the Hornblower Saga , 1964. Here is a link to Amazon's The Horatio Hornblower Series . The page also has links to the Companion, the Gregory Peck film, and the A&E television series.